Houston homeowner Sue Ahn celebrates her newly rebuilt home. Houston homeowner returns to a rebuilt home and thanks Samaritan’s Purse volunteers with a painting from her heart. Samaritan’s Purse President Franklin Graham joins Sue Ahn in surveying cleanup in her Houston home last October. When Samaritan’s Purse President Franklin Graham met Houston homeowner Sue Ahn last October, she’d survived the worst storm Texas had seen in many years. The threat to Sue’s home had been compounded by excess water released from two large reservoirs. It ended up that Ahn’s neighborhood was in the path of that torrent, which left more than two feet of water in her home. She evacuated with little more than her purse. When they were finally able to return, Sue saw the damage was extensive and would be costly to repair. Then she and her husband Sean heard about Samaritan’s Purse through their church. Soon after they called us, our volunteers began to remove soggy, molding walls, ruined belongings, and other debris from their home. But they wondered how they would make the costly repairs necessary to make their home livable again. Sue and Sean Ahn celebrate completion on the rebuild of their Houston home. At about the same time, Franklin Graham pledged the help of Samaritan’s Purse for repairing and rebuilding 500 homes damaged by Hurricane Harvey in southeast Texas. The Ahns’ home was one of those. 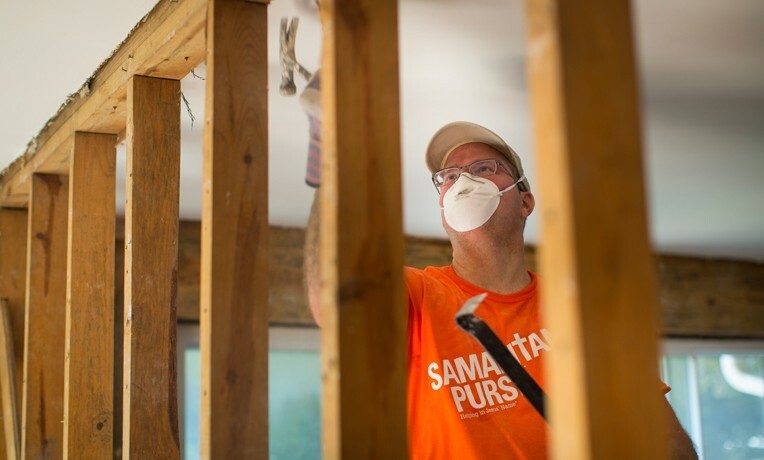 Since October, orange-shirted teams of Samaritan’s Purse volunteers have been arriving weekly to rebuild the Ahns’ house. April 25 was dedication day. Sue has shown great hospitality and creativity to give back to those who have helped her. From day one she has worked alongside our volunteers, encouraging them throughout the day and providing meals. She has also shown her gratitude both to them and to God through an inspired painting. She painted a tribute she calls “God’s Orange Army,” dedicated to the men and women who worked tirelessly, week after week, restoring her home. Sue Ahn helps lead worship in her home, newly rebuilt by Samaritan’s Purse volunteers. Now Sue and Sean are moving back into a home with new insulation and new walls, along with new floors, cabinets, bathroom interior, plumbing, electricity, heating and air, windows, and doors. Sue says she’s still amazed by the volunteers willing to give so selflessly in Jesus’ Name. “Through this disaster I have gained a lot more than what I lost,” Sue said, recalling the discouragement she faced before volunteers showed up. “This is God’s grace. I believe God sent people to rebuild this house. Through Samaritan’s Purse volunteers I can feel heaven. Please pray for our continued efforts in the Lone Star State and for families and churches as they strive to rebuild. Our post-Harvey reconstruction efforts in Texas include repairing or rebuilding 500 homes, replacing 250 mobile homes, and providing reconstruction grants to more than 160 churches.